Details on the original bridge connecting Scotia and Schenectady. Construction images and interesting details about the conception, flaws and aesthetics about this bridge. 185 billion gallons of water flow through the Mohawk River's final twenty miles each year. The Erie Canal was dug on the Saratoga County side of the Mohawk from Rexford to Crescent to appease orchard farmers, the brick factories, and the timber industry. Freeman's Bridge (built in 1855) was washed out or replaced due to rot 2 to 3 times? In 1879, the town of Glenville bought Freeman's Bridge to collect the tolls for the town. The Schenectady-Saratoga Trolley bridge was the "longest trolley bridge in the world. The flood of 1914 destroyed almost all the bridges across the mohawk in the area. The Trolley Bridge at Alplaus met its demise on December 7, 1941, just two hours before the attack on Pearl Harbor. The steel of the bridge was removed in 1942 for war materials ... "the steel went to war"
Niska Isle is home to roughly nine households. Niska Isle, despite its name, is not an island, but a peninsula in the town of Niskayuna, New York. It has a fascinating history. Be sure to "Google Map It" — there are both nice aerial and street views. 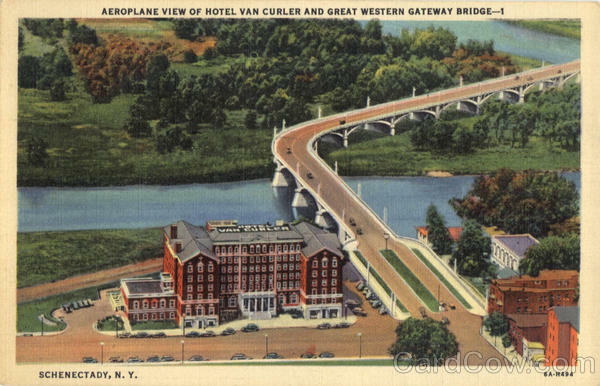 Also of interest >> Map from "Way Back When..."
Old Photos of Schenectady N.Y.
And lastly, this interesting interactive map Cycling the Erie Canal is a great way to learn more. Click on the Historical Structure Layer Button and zoom in and out of the Aerial Imagery view.